Believe it or not, making a hit game doesn’t have to take years. David Reichelt famously created Color Switch in just a few hours. Within one week, he had completed all the levels and finished the game. This was the version that hit #1 in the App Store. It was ranked #1 in not only the games category but also #1 in the All Apps category in over 50 different countries. The game went on to break the mobile record for holding the number one spot for the most consecutive days in a row, an impressive 27 days. 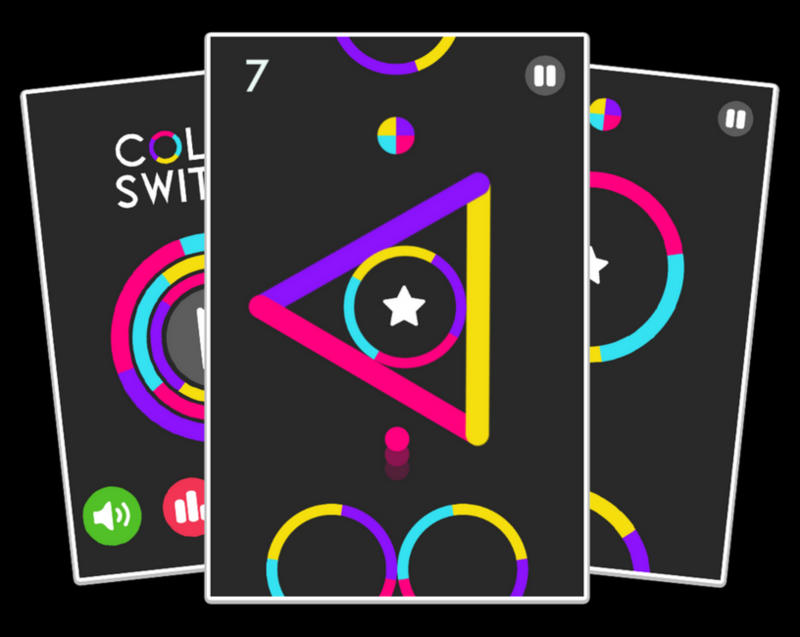 Currently, Color Switch is still in the Top 100 and has reached its biggest milestone to-date, amassing over 150,000,000 downloads worldwide. In the exclusive Color Switch Interview, David discusses exactly how it was done, let’s dissect it here. First David had to come up with an idea. As we often urge developers to do here at Buildbox, he started researching top performing games and trends. Then he created a list of different inspirations. Games on his inspiration list for Color Switch included Flite, Dot Up, Doodle Jump and Bounce. Reichelt also investigated any games that he found where the character was moving up the screen or that had colors or shapes as their theme. He even jotted down the Google icon that features a color-changing ball when you open up GMAIL, on his list as inspiration. Once David had done his research and made a long list of inspirations, he needed to spawn some new ideas. He did this by using different tools from the book called Thinkertoys by Michael Michalko. In the book, Michalko breaks down several different Thinkertoys, which are creative techniques that show you how to get ideas. Although similar to the ‘Model and Improve’ method, Michalko’s SCAMPER takes things much further, with 9 specific techniques that you can apply to help totally reinvent any concept. Each letter represents a set of questions that you need to ask yourself to help new ideas emerge. The first technique is substitution. This experimental approach involves substituting one thing with another repeatedly until you find an idea you like. When you’re applying this technique to game creation, you’re looking at one of the games on your inspiration list and brainstorming which feature or theme could be substituted. What else could you do instead? Maybe change the rules, switch out the theme, power-ups or main character with something different. The second technique is combining. Think of ways to combine or merge one idea with another to transform it into a completely new concept. A lot of these techniques are in-depth laser focused ways to model and improve which is key for creating a hit game. There’s a quote that goes, “Good artists copy, and great artists steal.” What this quote means is that although you may not have been the first to do it, you executed it so well (modeled and improved) that everyone thinks it’s something original and yours. This quote summarizes the third technique which is adapt. When you’re applying this method you must ask yourself what features could be adapted. What else is out there that’s similar that would work well for this too? In terms of games, this could be a cool backdrop or a special effect that particularly stands out. Just about anything can be modified. The fourth technique is all about brainstorming possible changes. Look for aspects that you could change in the game to make it better. Does it have a boring interface? Perhaps you could modify it with animations, interactive buttons or sounds. Magnify is also part of this technique. Think about what you can do to magnify or add to your idea. What can be extended or used to give it additional value? Let’s say, for example, a game that inspires you has very subtle sound effects or minimal music. In your game, you might want to add a custom soundtrack that compliments the game and louder sounds to draw more interest. The goal of the sixth technique is to find other uses for an idea. Ask yourself, what could I make from this? Try to think of new ways to use certain game aspects or features. For the seventh technique, ‘Less is more.’ In this step you must examine what you have so far and ask yourself, what could I eliminate? Is it anything that is redundant, cluttering up your interface or just plain not necessary? If so, don’t be afraid to eliminate it. You can always save it for another game idea. The eighth technique is a really fascinating one. It’s the reversal principle which requires you to brainstorm different ways to mix things up. Think of ways to add the unexpected to your game’s gameplay. Perhaps you could make the ball or character in your game go in the opposite direction or up instead of down and vice versa. An awesome example of this is the 2008 indie game called Braid. Designer Jonathan Blow added an unusual game element that gave players the unlimited ability to reverse time and rewind actions in spite of dying. He may not have been practicing the SCAMPER method like Reichelt when he came up with the game concept, but he was definitely thinking outside-the-box. And that’s the whole point of this technique, to shake things up. Combining isn’t the only sure-fire method to transforming old ideas into new ones. You can also rearrange concepts to turn one thing into something entirely different. In the ninth and final technique of SCAMPER, you have to conjure up new arrangements. This involves thinking of different layouts, sequences, patterns and components that could be interchanged. As he mentions in his sit-down with Trey, it’s not about how to build a hit game. You have to be more focused than that. With these methods, being focused is key for achieving the best results. You have to be precise in what you want to accomplish and execute. Reichelt made his goal, ‘How do I build a game that you tap on the screen and the character goes up, that’s different.’ He did his research, dug deep, captured as many ideas as he could and jotted down every possible inspiration that caught his eye. Then he studied those games and model and improved using the SCAMPER technique from Michael Michalko’s book until he spawned a great game idea that he wanted to pursue. David started with a preset in Buildbox and started playing around with different ideas. He took the concept of the game Flite, with an attribute of an object opening up and started brainstorming. Using the third technique in SCAMPER (Adapt or Add), he asked himself, “What can I add to this idea to make it even better?” His answer to this was, “How about multiple openings?” Then he came up with the idea of also adding different colors. The ideas just kept flowing. As the saying goes, ‘the best way to have a good idea is to have a lot of ideas.’ Reichelt did just that, using the SCAMPER technique. It only took him about 20 minutes to whip up some basic circle shapes to use as graphics in his game. After he dragged and dropped the art into Buildbox, David made 3-4 adjustments to the settings in the presets. 10 minutes later, Color Switch was born. “When I thought of the idea for Color Switch, 30 minutes later I had a demo in the software,” stated Reichelt. To make a game that’s successful, all you need is a good idea and the right tools. Reichelt had both. He was able to spawn great game ideas by using Michael Michalko’s techniques. He was also able to quickly create an early working prototype of his game in just 30 minutes due to Buildbox’s rapid development features and ease of use. Both were key factors in his success. Once Reichelt had a completed his game, he decided to seek feedback. When you’re trying to make a game, seeking feedback before release is important to do. Feedback gives you additional insight on not only how your game is perceived by others but also on your players’ overall experience. It’s a critical tool to use to help improve your game’s features and performance. David wanted feedback on his game and what could be improved. He also knew he wanted to go the publisher route with his game but wasn’t sure the best way to go about it. So, he posted on the official Buildbox forums and asked, “Does anyone know any publishers or anyone I could talk to I think I made an A+ game.” The first to respond to his post was an indie developer, Florian Porkert (creator of the hit, Ball Jump). He shared some helpful tips on color palettes for Reichelt to try. Then another guy on the forum referred him to Zeb Jaffer, the Co-founder of Fortafy Games. When he pitched his game to Zeb from Fortafy, he sent him a 30 second gameplay trailer of his game. This is important to do whenever you’re pitching to any publishers. Screenshots don’t give people a good feel for your game. Trailers are great visual tools to use to give publishers a better understanding of your game and it’s potential. The team at Fortafy was impressed after seeing Reichelt’s game trailer and signed him. In just a week after signing with Fortafy Games, Color Switch had hit 1M downloads. In our last article, called ‘10 Things Indie Game Developers Should Know’, we mention the importance of networking for indie developers. Similar to the way David was able to find answers and connections via the forums, the gaming community is one the richest resources developer have at their disposal. Being an active part of the gaming community to learn and network is key. Forums are an excellent platform to use to find valuable feedback on your game. It’s also good to use for networking and to help build potential relationships. Due to David being active in the gaming community, he was able to find feedback to better his game, plus several important connections which opened up opportunities that ultimately led to his success. During his interview with Buildbox founder, Trey Smith, Reichelt was asked, ‘What piece of advice he’d give to anyone wanting to create an amazing game?’ Instead of just one, David decided to share three pieces of advice that he believes are essential to creating a hit game. You’ll have to check out the full interview to hear all of them, but for now, I’d like to share with you one little tidbit of advice that he mentions in the interview. Reichelt had created over 40 different games that had failed before he found success with Color Switch. “Too many people quit when they get to a certain number of failures. And that’s a mistake,” he states. His advice to developers is, “You have to L.A.F. throughout everything, which is an acronym for Learn, Apply, Fail. And repeat until you reach success”, said Reichelt. His success was very systematic. He studied and applied many different techniques and tools to create his hit game. It’s important to study success so you can create your own versions of it. Analyzing popular games can give you a road-map to how it was built, monetized, and marketed. This type of research is key. When you reverse engineer similar games that are doing well, you’re able to find out what they’re doing that’s working and emulate that. This is the secret to making a hit game. Modeling and improving will help you make a game that is unique. Reichelt found different ways to model and improve his game concepts using the techniques in the book Thinkertoys. He was able to use Buildbox’s rapid development to quickly create his game. David networked through forums and made the right connections that helped his game gain massive exposure. You probably won’t be able to copy the exact steps he used, but they can definitely lay the groundwork for your next release … what did David do that you are not?